Today we get another ANECDOTE from my personal experience with the horror genre and it’s a pretty interesting one. I graduate high school in 1981 and made my way to the University of Georgia. 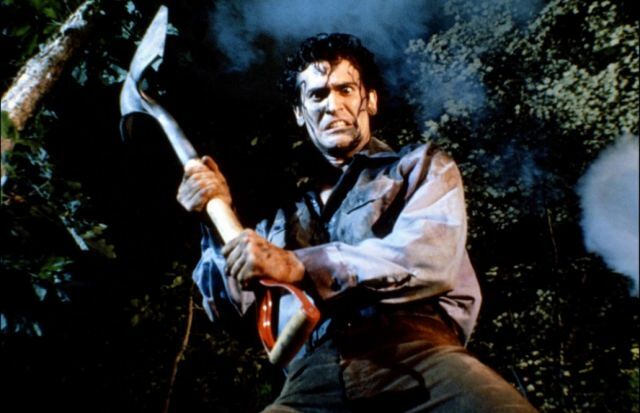 That October a little film was released that nobody knew anything about called The Evil Dead. My friends from college, Tom and Bill, and I decided to go see a horror movie. Well, the one we wanted to see was sold out, so we decided to see this movie we’d never heard of. It sounded good. 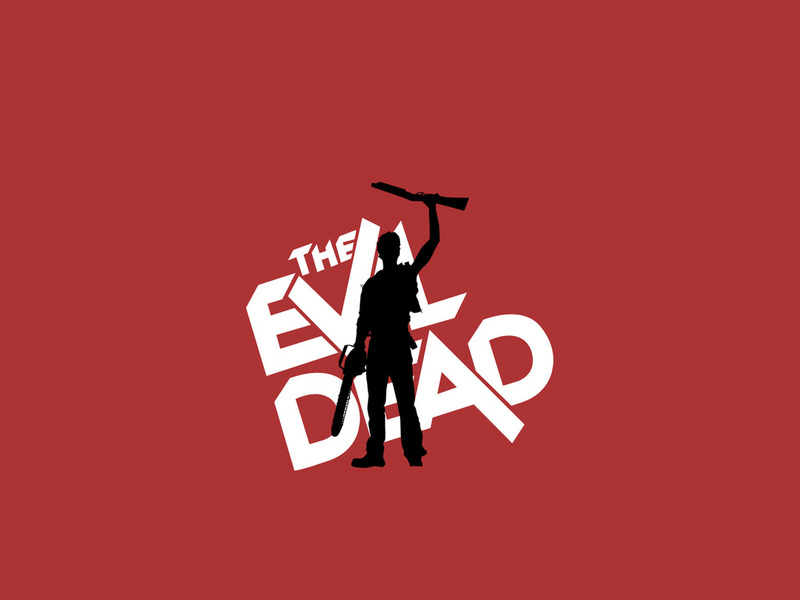 Evil and Dead in the title and all. So in we went. We sat down and I think I was in the middle and Tom was next to this young couple, the boyfriend next to him, his girlfriend on the other side. You know how some movie experiences COMPLETELY depend on the people you are with and how they experience as well? This was one of those situations. Combine that with the fact that I can handle monster movies, alien movies, ghost movies, and even psycho slasher movies because at the end of the day I can tell myself that those things don’t exist or at least not in my world. But Sunday school had taught me that there were such things as demons who could possess you! 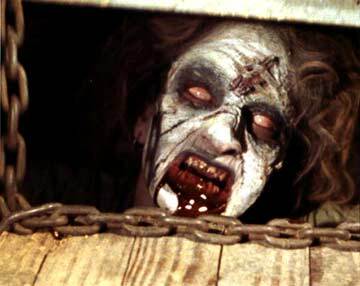 So I tended to stay away from the demon possession movies...and wouldn’t you know it, but The Evil Dead is the granddaddy of low budget demon possession flicks! So then it became a big game of chicken with my friends to see who was going to flinch first. “We were all having a good time, until the scene where the girl was guessing the cards and the girl who got raped by the vines started calling out the cards quicker than they could turn them up. Her voiced changed to demonic and she said "Queen of Spades" and I said "You can roll the credits now!" I ended up with me feet in my seat clinging to the person in the seat beside me, a big linebacker looking guy who was just as scared as I was, while his Girlfriend looked at us with pity, she was not afraid. Afterwards we tried to ease the fright by going to see the midnight showing of Monty Python and the Holy Grail. 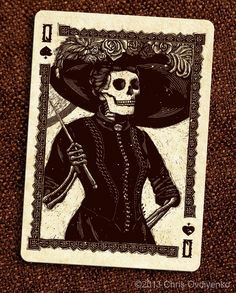 It worked until I got to bed and closed my eyes, all I could hear in the silence was "Queen of Spades." Ah, the memories! My friend Tom has gone on to become a successful actor specializing in historic recreations. My other friend Bill, who was with us, went on to become an amazing special effects artist for film and television who works in Atlanta. I get to bring my foreign students to his workshop when they visit America and he is always so gracious to let them see his basement of horror! So we’re on our way to see the movie and I’m driving the van and they start asking me about the movie. 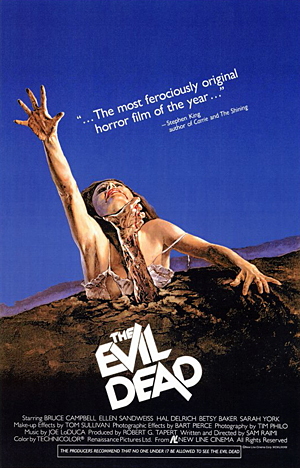 I told them, “All I’ll say is this was the scariest movie I saw when I was young.” I didn’t want to ruin anything for them with spoilers. So they were pumped…I was pumped…the crowd was pumped as a Taiwanese movie crowd can possibly get. Then the film began and it was the biggest gorefest I’d ever seen. These poor Taiwanese kids felt like they had been drenched in blood. And of course they come from a different religious background where ghosts re far more real and scary to them then demons, so there was that, but they were not impressed. Crept out, disgusted, and frightened…yes…but not impressed. There’s a saying that “You can never go home again” and I guess that’s my philosophy of remakes, but I always give them a chance. And I had prepared myself for this remake to be its own film and not just a frame for frame remake of the original. I get that. But still I think what disappointed me the most was that I secretly wanted to recapture that original experience with my friends…and even though I did have students on both sides of me hiding their faces in my shoulders…it just wasn’t quite the same thing. 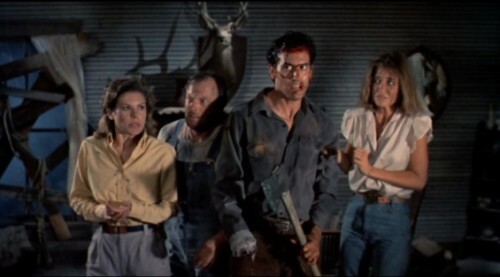 Who knew that a creepy, totally gross film about 5 kids going into a cabin in the woods and finding the Book of the Dead would lead to a franchise, an Off-Broadway Musical, and a remake 32 years later? 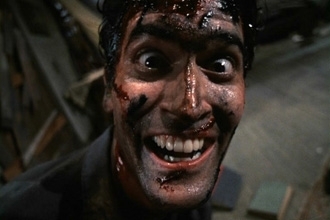 I tell my literature students that f they ever doubt the power of literature to just read out loud from the Necrocomican! Recollections of an amazing movie experience and then again 32 years later.